I'm thinking of using Bandicut to put together a tutorial for a video game I'm making. My concern is that if I record the audio as part of the video, then I might find that the game footage is good, but I don't like my voice; or my voice is fine, but the game footage isn't quite right. So, the way I'm thinking of doing it is to record the video (using Bandicam while playing the game); then record my own voice separately (in, say, Audacity); and then place the best audio over the top of the best video (using Bandicut). So, I found this topic on the forum (https://forum.bandicam.com/viewtopic.php?f=10&t=5395), where people say that it is possible to do this. However, they don't say how one would do this. Looking at Bandicut, I can't figure out how you would go about it. Should I be using Join, seeing as I'm effectively joining one file to another? Also, Bandicut doesn't let you load audio files, such as WAVs and MP3s, so how would I open the audio file in Bandicut? Is the solution something like to save the audio as a video file? If anyone can point me in the right direction, I'd be very grateful. Re: How would you play an audio file over the top of a video? 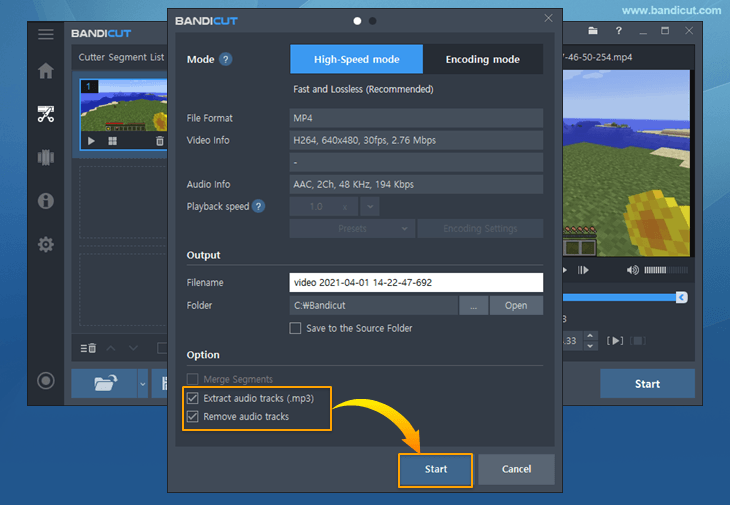 Unfortunately, the current version of Bandicut doesn't allow you to add an audio file to video.